The popular festivals in Tanzania are multicultural, as Christian, Muslim and other traditional African religions coexist within this country. Each denomination has its own celebrations and many of them take place privately within each tribe. Nonetheless, there are many official festivals in Tanzania which the tourist can watch and enjoy. This takes place on the 1st June and is a very important festival in a country in which 40% of the population consists of children and adolescents. The objective of the celebration is to emphasise respect for the rights of children and to highlight the importance of the family unit. On this day, there are solemn parades through the streets and gifts are given to children. One of the most impressive events that you can experience in Tanzania is the great migration of wild animals. It begins in April with the coming of Spring. Thousands of grazing animals migrate in search for good pasture and fresh water and you can see thousands of antelope, zebra, gazelle and gnu travelling in herds. This huge exodus provides a great opportunity for predators, who are always lying in wait. We recommend that you watch this incredible spectacle from a hot air balloon, where you will be able to see the different groups of animals moving in herds. Another of the most popular festivals of Tanzania is the unification which came about as a result of centuries of struggle to liberate the country. Tanzania was the commercial land of slaves until the inhabitants had a fierce revolution, after which came their long-awaited liberty and the unification of Tanganyika and the Zanzibar Archipelago. The events on this day are extremely solemn because of the important milestone which they commemorate. If the traveller is looking to immerse himself in the culture of Tanzania, the Wanyambo festival is a great opportunity to do this. It is celebrated at the beginning of January in Makumbusho, a region in the northern area of Dar es Salaam and it consists of dancing, traditional music and costumes, as well as traditional food. For those looking for events in Tanzania with a little more action, the Kiliman Adventure Challenge organises a triathlon in the foothills of the mythical Kilimanjaro. The competition includes a trek in Kilimanjaro, a cycle race around its circumference and, finally, the proper marathon. There are options to do a half marathon or another easier and more fun type of race that will allow all types of people to take part in the adventure. It takes place in February, which is when the temperature is the coolest. This is celebrated in the month of May at Kigitonyama, to the north of the city of Dar es Salaam. The festival lasts for two days and offers acts by local artists who interpret the country’s traditional music, and there are also extremely interesting cultural exhibitions. This is another popular Tanzanian festival that is well worth going to see. It has been celebrated at Stone Town for more than 10 years and is an event where the cultures of the whole African continent come together. It is a mix of tradition and modernity where you can hear African hip-hop as well as the mystical acts of some of the most ancient cults. Travellers who stop off in Zanzibar can enjoy one of the most unique of Tanzanian festivities. It lasts for four days during July and August and is an old traditional festival. The men use banana stalks to beat each other with. This is done to resolve the conflicts of the previous year. The women get dressed up, dance and sing. This culminates when a straw cabin is set alight. After this, the festival begins. One of the most important cultural events in Tanzania is the festival of music and cinema held at the beginning of July. The Zanzibar International Festival of Cinema is the highlight of these two weeks filled with art. You can enjoy lots of local screenings in many different locations around the city. Eid al-Fitr, the celebration to mark the end of Ramadan, also takes place in Zanzibar during the month of August. We particularly recommend the celebrations at Makunduchi, where there is more dancing, music, pomp and food. 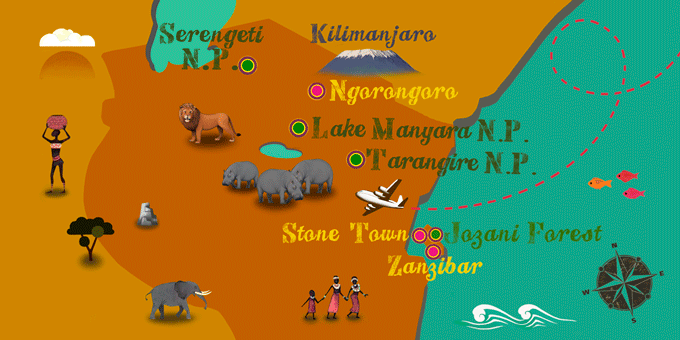 The Travel and Tourism Fair at Karibu is a must-see event for travellers in Arusha during the months of May and June. This is the most important fair of this type in the whole of East Africa. There are exhibitions and sales of a great variety of traditional Tanzanian items, such as crafts, wines, precious stones, furniture, safari equipment and much more. As you can see, the popular festivals in Tanzania are diverse, distributed throughout the whole year and full of fun, music and colour. So, when you are planning your trip, keep them in mind so that you can make it to some of them.